A birthday is one of those days where you can ask for gifts that you normally wouldn’t purchase yourself. The new Philips wake-up light is one of those things. What does it do? It simulates a rising sun together with birds singing, to fool you in getting up naturally. I was curious wether this would work. The alarmclock (a clear understatement it is truely a wake-up light) has a lightbulb built inside that gets brighter and brighter in the timespan of 30 minutes. At the of the 30 minutes birds start to sing. On the box it reads “medically proven benefits” and I always hesitate when products claim these facts. But…I must say…after owning it for three weeks now, I am very happy with Philips new invention! 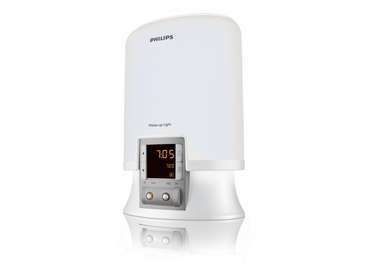 This is my view of the Philips Wake-up light, I own the HF 3451, I hope it helps everybody outside who is interested in buying. My conclusion? If you don’t like waking up, get one! Wow, this looks great!!! I want one too……. Noise and light – excellent combination!